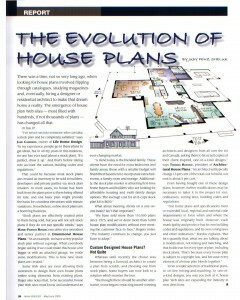 In its May/June issue, Home Builder Magazine, the official magazine of the Canadian Home Builders’ Association did an interesting report about the evolution of house plans in Canada. Judy Penz Sheluk contacted us to get our opinion about the stock plan industry and the emergence of house plans web sites. You can read the entire article by clicking here. Marie-France Roger, my partner, was the one interviewed by Mrs. Sheluk and explained that Stock House plans can be sold as is or modified to suit the customer’s needs. We can even do a compelete custom project, on-line, by exchanging information with the customer / Builder. Some designer, like Mrs. Jane Cameron from Life Home Design, think that people can not be 100% satisfied with a stock plan… Over the years more than 110 000 people can argue with that because it is the total number of stock plan we sold in the past 35 years ! However, a stock plan company must be able to do some modifications to their plans to make sure that we can serve all types of customers and this is what we do. In the past, people who wanted to do some modifications or get a full custom design had to meet with a local designer to get a complete set of plans. Today, we can all do it on line (we do more than 500 modified / custom house plans per year without meeting direct with the customer!) and tailor a complete design to the customer needs and then, by also contacting local engineers and/or architect during the project to complete the plans and meet the local regulations. Customer saves time and money. Our costs are about 1 to 3% of the total cost to build. Get a quote right here ! If you go to a local designer with some images of a stock plans, make sure that the designer gets the copyright licencees from the original designer and work legally on your project because those plans are potected by our Canadian Copyright law. The original designer has the total right to sue you and your designer… Don’t get in trouble and work legally! Drummond House Plans has some programs for local designers / drafters who would like to modifiy a plan based on our design; it is simple, quick and not expensive ! Click here for more information. Special thanks to Mrs. Sheluk and to Charlie Blore, Editor of Home Builder Magazine. Businessman, blogger and speaker, Yves Carignan chairs and directs Drummond House Plans since 2002 with his wife and partner Marie-France Roger. Congratulations, that is a big Canadian magazine, it is a huge accomplishment to be published in it. That’s a great achievement to be featured your site on a well-established home builder magazine. Congratulations! ← Previous Post: Rain Screen Use – The “wet” Coast and Beyond!